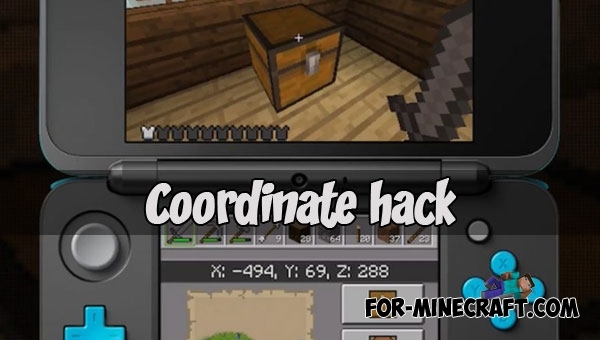 When Minecraft was announced for New 3DS devices, many noticed that the player's coordinates are displayed on the secondary screen. And it's pretty strange. The fact is that the developers have repeatedly stressed that the coordinates is almost a real cheat allowing players to gain an advantage in the survival mode. Agree Minecraft where the character is in an unknown place and without any tools, should not provide a similar means of navigation to the players. In the Java Edition version, the coordinates are displayed in debug mode, but beginners usually do not know about its existence and this mode itself was added more for developers, not for players. The player's coordinates were also displayed in the Minecraft Console Edition. This was most interesting: they were displayed on the map, and to see them you need to perform a normal game action - take any map in your hand. But even this way of displaying coordinates did not appeal to the developers. Coordinates are displayed in Minecraft 1.2 (formerly PE). Developers have taken this step, because the new version will replace the version of Console Edition on Xbox One and Switch devices, and players are already accustomed to this function. However, coordinates in Minecraft 1.2 can not be considered as a game function. In order to see them you need to change the game rule, which can only be done if the commands are activated, which means that the progress achieved during the game will not be taken into account by the achievement system. Therefore, when the Minecraft New Nintendo 3DS version came out, there were players who felt injustice. Developers say that it is impossible to add coordinates to the game and at the same time they release a version in which the coordinates are visible and displayed more conveniently than on consoles or PCs. Minecraft for Nintendo 3DSNow Minecraft is ported to the Nintendo New 3DS game console..